It's a River Tyne crossing, part of the large planned urban motorway network for the Tyneside area. OK, tell me about the story then. Well, the background story can be found in the "Tyne Side Story" feature. However, this is one of the least well-known routes in the planned system - indeed we haven't so far been able to find any mention of the crossing prior to 1972, which when you bear in mind that the entire system was cancelled in 1975 doesn't give it much chance to appear in too many places! Right. So I guess it's bemused quite a number of people? Certainly so - even some of the members of SABRE have been confused by it. As anyone with a map of the area handy could tell you, there's not very many Tyne crossings. Most of those crossings are to a low standard - even the famous Tyne Bridge is only single carriageway, though granted it is two lanes in each direction. 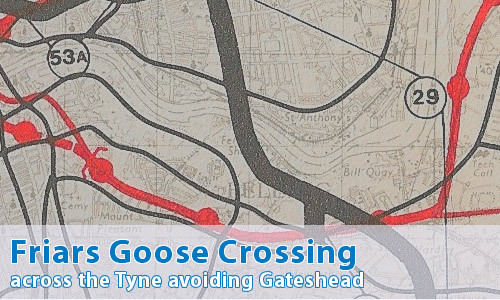 The Friars Goose Crossing was meant to assist in solving that problem, and indeed was intended to become one of the major routes into Newcastle city centre from the south - with a little help from one or two of its friends. I notice it's called "Crossing", not "Motorway". Are you sure it should be here? To be fair, I can't be certain whether it was to be under motorway regulations or not. What I can say for certain is that it was planned to be a dual carriageway with three lanes in each direction, met motorways at both ends and given that Tyneside was very keen on its motorway network, I'd say that the balance of probabilities lean towards the motorway side. OK, so where would it have gone? It would have started at the end of the Shields Road Motorway - in that nice gap just to the south of the roundabout between Union Road and Millers Road. It would have then followed Union Road and Allendale Road southwards. If you follow the route on aerial photos, you can see the large gap just to the west of the B1314 - a gap nicely wide enough for a motorway to fit into. Allendale Road then comes to a crashing halt on Walker Road (A186), but again if you look at the aerial photo, it's blindingly obvious that there's a gap straight ahead to the side of the river. This is the site of the Friars Goose Bridge itself. Very interesting! However, I spot a problem ahead. Don't worry, I'm way ahead of you. Crossing the river to the Gateshead side, we come across some modern development over the route, which would have turned south-east at this point, with a short spur running to the junction of the "other" Shields Road (the Gateshead version) and the A184 Felling Bypass. We lose the route again under some modern housing, before it becomes obvious once again at the enormous junction between Kirkwood Gardens, A195 Lingey Lane and the A184, where it follows A195 southwards (again with quite obvious gaps) until you finally reach the end of the route - at otherwise uttely unremarkable junction between the A194(M) and the A195. From this point it should be obvious that it was intended to make this the major route into Newcastle from the south, bypassing Gateshead in its entirety before dropping people on the East-West Motorway for access to car parks, or to head north via the old A1. Can you show the route to me? Not at present, they haven't.